Smartphone market 'generally healthy' despite recent dip. IDC says the smartphone market is generally healthy despite a recent contraction in sales and believes the industry will see double digit growth through to 2022. The analyst firm’s forecast says that although global shipments will fall 0.7 per cent in 2018 to 1.5 billion, a strong second half of the year is cause for optimism. By 2022, IDC believes shipments will have reached 1.7 billion. Android will maintain its dominance with a share of 85 per cent over the period, but the average selling price of each device will increase. Android sales are expected to reach 1.4 billion by 2022, with iPhone sales rising by 2.1 per cent to 239 million. What is less clear is how the industry convinces consumers to upgrade. A relative lack of hardware innovation and saturation in developed markets has meant many are holding onto their handsets for longer periods of time. Larger screens are seen as one way of doing this. The forecast suggests that two thirds of all smartphones sold in 2018 will have displays of 5.5 inches or larger, a figure which will increase to 84.5 per cent thanks to their inclusion in cheaper devices and new models of iPhone. "With two out of three new iPhones expected to be larger than 6 inches, Apple will not be left behind in the 2018 race for increased screen real estate," said Melissa Chau, associate research director at IDC. 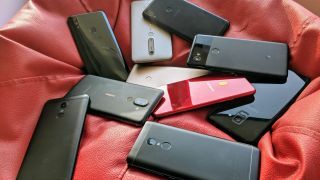 "You could say the term 'phablet' is becoming less relevant now that most smartphones will ship with larger screens, and when folding screens start coming into play in the medium term, this screen trend will evolve in new directions." But other drivers are less obvious. The arrival of 5G smartphones from 2019 onwards will help drive sales while others are looking to AI features as a way of differentiating their products. “We still believe the smartphone market has some healthy growth in the years to come, although finding and competing in those markets and segments is increasingly more challenging," added IDC’s Ryan Reith. “Many OEMs, retailers, telcos, and supply chain partners will be working diligently to ensure consumers see the need to upgrade when products and services are readily available."